I've read some very old threads on building a tilt front end. Is there anything newer or just plan new? Anyone build a tilt front end out of the original sheet metal? Luv, hard and fast! John Kay, Steppenwolf. Yes. Only pic I have is of it removed. I had taken the pic for a coil over thread here. 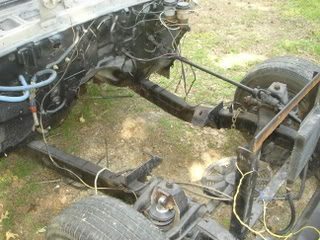 I'm thinking about going up on a straight axle and would like to build the tilt out of the original sheet metal. How did you build your's?